Type easy on your iPad with an external keyboard! Due to its convenient size and ease of use, more and more people are making the decision to ditch their laptops in favour of the iPad. Why? Well because iPads can do almost everything that a laptop can do, with the added advantage that they can easily be carried around in your handbag or briefcase. But if there’s only thing that the iPad is missing, it’s a solid keyboard. Sure, touchscreen is great but after a while it gets tiring on your fingers and it’s also far easier to make a typing error. One slip of the finger and suddenly your colleague has completely gotten the wrong idea from your work email! That’s why an external keyboard is a must for any chronic iPad user. With an external keyboard, you won’t have to worry about overworking your fingers and typos will be kept to a minimum! With Griffin’s TurnFolio case, not only is your iPad Air protected, but it can also be rotated a full 360 degrees for use in landscape or portrait mode. The cover folds into a stand that’s adjustable to just the right angle for tapping and viewing. Tucked inside this compact, easy-to-carry folio is a full-featured Bluetooth keyboard. Just fold the folio into a stand, lift out the keyboard (it’s held in place by hidden magnets) and enjoy the tactile feel and feedback of a real, responsive keyboard. Just pair it once, and the included micro-USB cable keeps your keyboard’s battery topped off with no drain on your iPad. Made from genuine leather, the Maroo Black Leather Folio delivers on protection and comes with a built-in thin Bluetooth keyboard to extend iPad usability. QWERTY key set with white backlight allows for keyboard use in any setting, and SG Bumper™ Technology fully protects your iPad Air, yet is simple to change out. 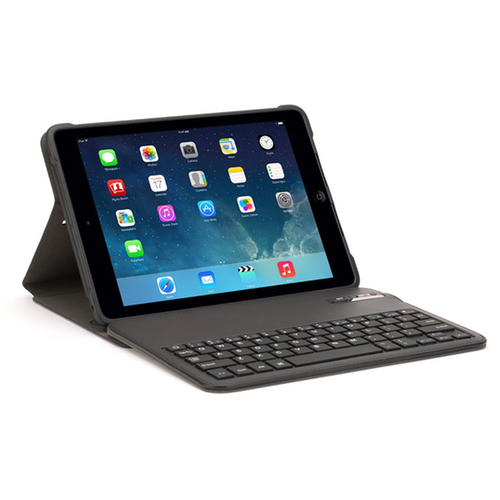 The ZAGG Folio is the thinnest and most diverse Bluetooth keyboard available. It features a unique hinge design that lets you position your screen at virtually any viewing angle and also provides full body protection to help keep your iPad mini free from scratches and dings. A powerful battery keeps it going for up to three months of regular use between charges. The Folio features full-body coverage to help protect your iPad wherever you go. With its durable leather textured cover and resilient case, it protects your iPad from scratches, dust, dings and more, and keeps it looking great. Measuring only 7.6mm thin, that’s barely more than a quarter inch, and with full-body protection, the Folio easily slips into a bag or purse so it easily goes everywhere you do. And while it may be thinner than most of its competition, it still provides 30% more typing space. To find out more about any of the products featured here, visit our website. Football Fanatics: Support your team with inToro’s iPhone 6 range!